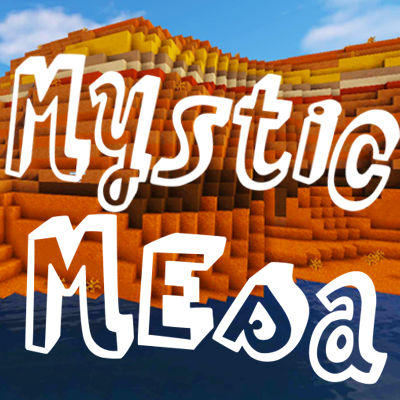 Mystic Mesa is a mod pack designed by Stacyplays around her favourite Minecraft biome, the mesa! Not only are these biomes now common, but they are filled with mysterious creatures including new types of mythical wolves, exotic birds, unicorns, dinosaurs and lots and lots of hostile mobs. Good luck! Stacy would like to thank SnowShock35 from the FTB Team for fine-tuning the pack, overseeing the creation of the Stacy's Wolves mod and making sure the mod pack would be available for download. This pack would not have happened without him. Also a huge thanks to Lyrael for coding Stacy's Wolves, Nathan Oneday and Jaspanda for creating the textures for Stacy's Wolves, the Walschaerts Build team for creating the Mystic Mesa resource pack overlay and testing the mod pack. And of course, a big thank you to all of Stacy's viewers for inspiring her and supporting her always. Disclaimer: Please allocate 4GB or more RAM to Minecraft before reporting bugs. You might be experiencing a memory shortage issue. Did you know that we're now partnered with CreeperHost? Thanks to the wonderful people of CreeperHost, you can now purchase a server from them with the following discount code, getting 15% off of your first month. Great for hosting the most up to date version of our mod packs. Click the banner below to get your server. Wanting to get involved? Join us on Discord. Our Discord server is a place to socialize with both our developers as well as other community members such as yourself. You'll get to see and join in with the conversation. The community is free to join and you can do so by clicking the banner below or clicking the following link to Join us on Discord. This mod pack is installed via the Twitch Desktop App. It's available for download at https://app.twitch.tv/overview/. If you need assistants installing mod packs there's a help guide available here. If you have a problem or issue to report for the pack please use the issues tab not the comment section! If you report an issue make sure to follow the issue reporting guide here. Be sure to check out Stacy's social media. Make sure to follow our lead developer, SnowShock35, on social media for the latest updates and news about mod packs and other exciting projects. Want to see what's changed? Head on over to the files tab, found at the top of this page and then select the version you want to learn more about. Can't see the files tab? Use the link below.